New Gracanica Monastery - On the feast of the Dormition of the Mother of God, August 15/28, 2008, His Grace Bishop Longin of the New Gracanica Metropolitanate ordained Hierodeacon Serafim (Baltic) to the priesthood. Together serving with Bishop Longin and local clergy were numerous guest priests and deacons from the Russian Orthodox Church Abroad, Greek Archdiocese, and Orthodox Church in America. Hieromonk Serafim (Baltic) completed his studies at the Holy Trinity Seminary in Jordanville, New York in 2008. He was tonsured by Bishop Longin on Holy Thursday 2005 at Monastery New Gracanica. 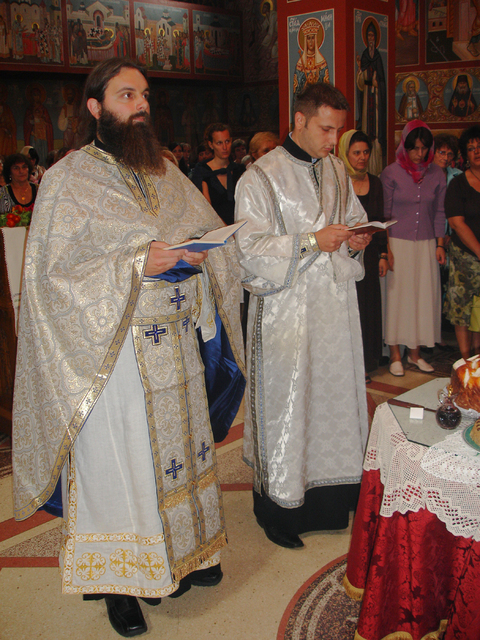 On the feast of St. Elijah the Prophet, August 2, 2006 he was ordained to the diaconate at New Gracanica Monastery. He is one of the monastic brethren of the New Gracanica Monastery in Grays Lake, Illinois and a cleric of the New Gracanica Diocese.